We just got home from camp; it was wonderful, and we'll share more later this week. I wanted to give an update on the plan for Scarlett's surgery tomorrow, as I know many people will be looking for updates on her condition. The vital info: Surgery is scheduled for 7:30 am PST at Children's Hospital Oakland. The surgery is scheduled to take about 8 hours - however, it could be longer (or shorter, though most likely longer). We will get updates from the operating room every 2 hours or so, and we will do our best to keep the blog updated from our camp in the cafeteria (Wi-Fi-willing). We appreciate all the support we have received in the past, and know that you will all be waiting anxiously along with us, so we will try to make sure to share when we can. Scarlett is a very blessed little girl, and doesn't really need much in the way of toys or blankets right now. 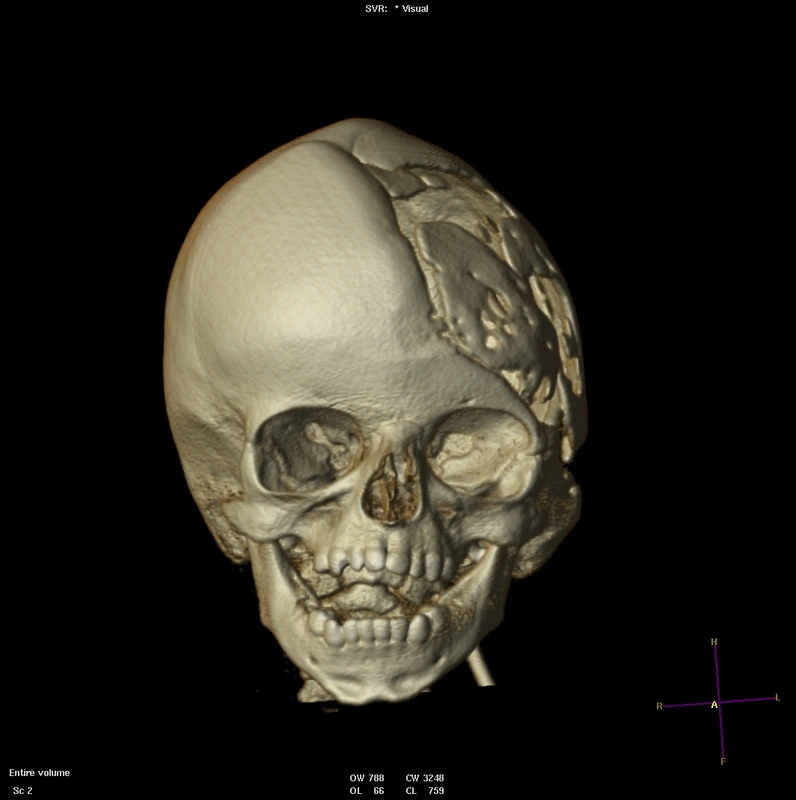 WARNING: I included some more graphic CT images and details in this post. If you are sensitive to such things, you may want to stop here. Not exactly your typical baby portraits. They described the problem they are facing when reconstructing her head. The sutures, or seams, of her skull have prematurely fused. This can happen naturally, called craniosynostosis. In Scarlett's case, it was caused by a few unique factors. Her brain is smaller than average, and combined with the low pressure of her current shunt, did not exert enough pressure on the bones to stimulate her skull to grow. 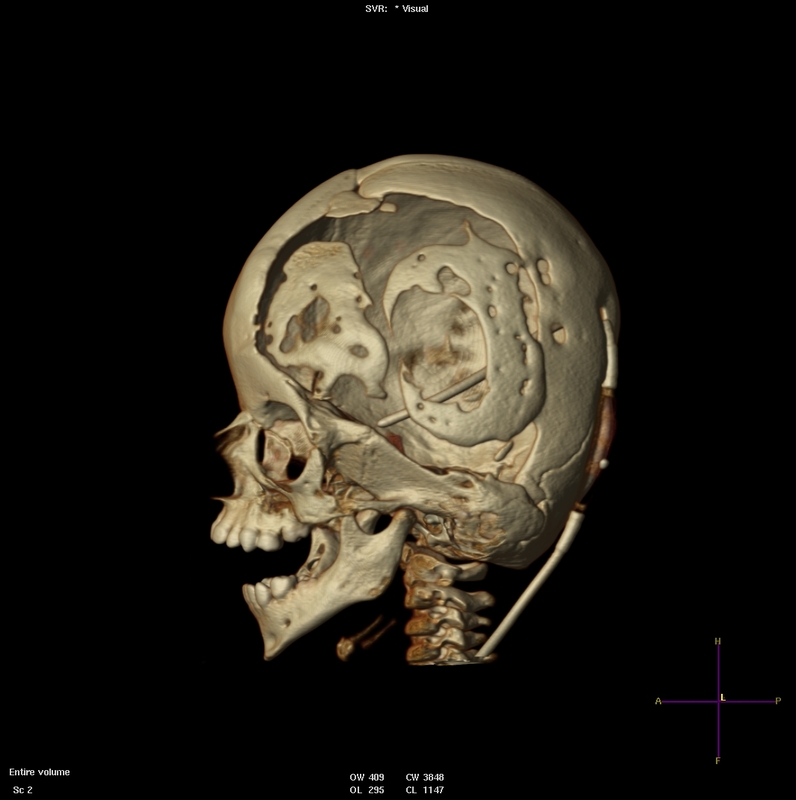 Since the bones were not pressed to grow outward to accommodate her brain, they just fused. This is a problem for a variety of reasons, including cosmetic, but mainly because her brain IS growing. So much, in fact, that it has nearly filled her skull, and has left very little room for fluid (thanks to the faulty shunt allowing too much drainage.) The midline of her brain, which should be centered (and was until about November of last year) is now significantly shifted to the left.If we did not repair her skull now, her brain would quickly outgrow the space it has, and cause severe neurological effects. As if that wasn't enough, the scary part comes at the end: they will block her shunt and allow it to begin filling her head with fluid. This will continue for a few days after surgery. The build up of fluid will push the caved in bones out to a more rounded shape and fill in the space created by the surgeons. Eventually her brain will adjust to additional fluid and hopefully bring the midline back to center. The scary part is that in order to create the right volume and pressure, we will have to wait until we see signs of too much pressure - vomiting, eyes looking in different directions, discomfort from headache, and a possibility of seizures. These symptoms will indicate that the open cavity in her skull has filled with fluid, and cant hen be properly shunted. We were not pleased to hear this, but it is a case of making her worse to make her better. It will be handled in the ICU (the idea of us watching for this at home had me panicked), and therefore caught soon enough to prevent any real damage. We are planning for at least a full week in the hospital; as we well know, things change, so it could be longer. Once Scarlett is discharged, she should be able to return to her regular activities relatively quickly. We want her to be back in therapy as soon as she is safely able; she will also receive PT and OT daily in the hospital as soon as she is able. She will not need a special helmet or head-shaping device. The plastic surgeon will ensure that all the incisions are hidden and as minimal as possible (he continually reassures us that he'll "keep her looking even cuter!") . We are nervous, anxious and ready to get it over with. We have been anticipating this surgery for over a year, since her skull first began to sink in (look back to posts in June-August 2011 for what it looked like then). As much as we hate to subject her to more surgery, we know it is the best, and only, course of action. We trust her doctors - honestly, if he can remove that nasty tumor as well as he did, I'm sure he'll do fine with just bones. You all will be in my thoughts tomorrow! Praying!! I've asked for prayers on Cranio Care Bears page too. She will be on our minds...thoughts and prayers with Scarlett and the both of you tomorrow! I'll be keeping Scarlett and your family in my thoughts and prayers. My thoughts and prayers will be with Scarlett, your family and the medical team tomorrow! Praying for you, Scarlett, and the doctors. Praying for God to guide the doctor's hands as he performs the surgery and praying that he wraps his loving arms around Scarlett and that she will be in as little of pain as possible. I'll keep Miss Scarlett in my thoughts and prayers tomorrow. I know many, many readers will be praying and checking your blog tomorrow. Thank you for taking the time to update us internet peeps, as I know you will all be worrying and waiting there. Take care! Go team Scarlett! I will be praying for her, you guys, and the medical team. I can't even imagine how scared you must be. My thoughts and prayers are with you and your family today. May God protect Scarlett and give those surgeons steady, skillful hands. Much love and positive thoughts headed to you today! I have never commented before but i have been following your blog from the very beginning. I will keep your family in my thoughts and prayers. Scarlett and your entire family are in my prayers today. Prayers and best wishes for Scarlett's surgery today. I recently found your blog and am humbled and inspired by your family's story. As a mother of 2, I can not even imagine the road you have travelled so far. My grandfather died of glioblastoma in his early 80's and I wish and hope that no one has to endure that diagnosis. Keep strong, dear Scarlett! May the doctors be skilled, your recovery be swift, and your future be bright!